Why go through online slides alone when you can do it with other people? If you are one of the 45 million people who go to SlideShare every month to check out slide presentations like this one from Mary Meeker on mobile Internet trends, you are probably going to like Zipcast. Slideshare is launching the new service today with Zipcast buttons on every public slideshow that turns the slides into a Webcast with video, audio and chat. There are plenty of virtual meeting services on the Web—everything from Cisco’s WebEx and Citrix’s GoToMeeting to Adobe’s Acrobat.com, which have been out for years. But Zipcast is, well, zippier. It doesn’t require a software download or plug-in, and it doesn’t take over your entire screen. Instead, it is just a tab in your browser (thank you, HTML5 Websockets). Zipcast is also stripped down compared to other existing virtual meeting products. There are the slides, a one-way video stream of the person hosting the meeting, a conference call line for audio, and a text chat window. And if you are board during the presentation, you can skip ahead through the slides on your own. That’s it, and that’s all most people probably need for giving a pitch, presentation, or remote talk. And to share the slideshow meeting, all you have to do is pass out a regular link—every SlideShare user will get a customized link that looks something like www.slideshare.net/erick/meeting and that can be used over and over again for every meeting that person hosts. Participants can sign in with Facebook and can choose to send their chat comments out to their Facebook streams, along with a link back to the meeting, which is a good way to gather an audience for live events. Zipcast will have its own page with an activity stream showing what meetings are going on right now , along with comments, which could also drive more people into public meetings. There is no limit to how many people can join a meeting, Meetings can be public or private, but anyone with the link can view the presentation. If you are a SlideShare Pro member, which starts at $19/month, you can get password protected meetings, along with other bells and whistles. Zipcast will be bundled in with the other SlideShare Pro features such as analytics and removing ads. SlideShare just launched subscriptions a few months ago, and paid subscribers are “doubling every month,” says CEO Rashmi Sinha. 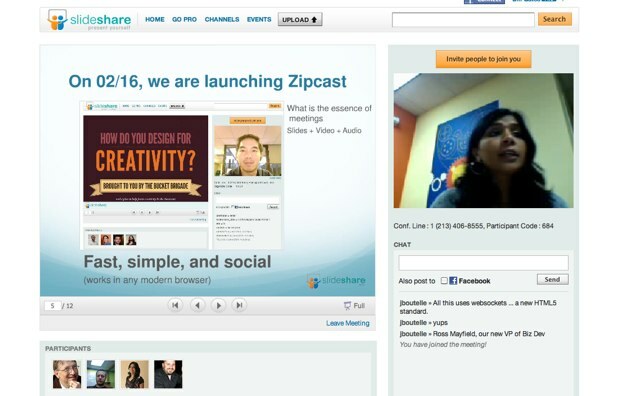 She plans on rolling out more premium features for Zipcast such as two-way video and the ability to embed Zipcasts. With Zipcasts, you can see how SlideShare will start to fold in new products to tackle the enterprise market from the ground-up, using its installed base of loyal SlideShare users to spread the word about new products. Socialtext founder Ross Mayfield recently joined the company as VP of business development to help pursue this strategy.